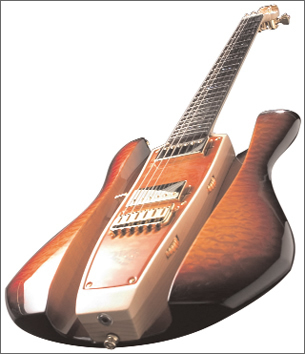 RKS Guitars are an American-based company who make very unusual guitars to bespoke specifications for a high cost. The only vaguely conventional feature of these astounding guitars is the silhouette. My first encounter with an RKS was in theÂ High WycombeÂ shop called BBZ Guitars. The shape commonly used by the company is an equal cutaway style, made usually of ash. The body has a central part which houses the pickups and bridge, and then there is an external part on each side with a pickup selector between the two pieces. These guitars were designed by Ravi Sahwney, an industrial designer, in conjunction withÂ Â Dave Mason, of Traffic and later Fleetwood Mac, and also a renowned solo and session guitarist. They are known for bespoke craftsmanship, often wild colour schemes, and of course the unique design. Also available is a differently-shaped model, the Wave, built on the same design principle, and the Uluru Boomerang V-shaped model available to custom order. Prices are usually from Â£800 or so onwards. Most models retail new for around Â£1,500. RKS also make basses and baritone models of their guitars. The neck felt great when we played the RKS, but the shape takes a lot of getting used to, mainly just because of what you traditionally expect, not for any problems playing the instrument. These guitars are always going to be rare I think, so I would definitely mark them down as a collectable guitar for the future. I have a couple of the exclusive RKS Dave Mason Guitars. They are wonderful to play, especially due to the Buzz Feiten Tuning System that keeps it in tune up and down the neck, as well as, for a long period of time. Also beautiful coloring and appointments. You can see them as well as my Virtual Music Instrument Museum, below.